Waiting for a Sailor… By Darya Kozhemyakina. Click here for more of the artist’s work! Ah, and so the one about the mermaids? Great photo, thanks for sharing. I thought it a good companion for my musing today. :-) I try to do that. Love the color’s darkness here. Not only can I see how it inspired you, but it also is like I realized night time at sea actually is. You wanna know how dark the world is outside the city lights. See the empty blue-black from the bow of a ship without moonlight. lol. 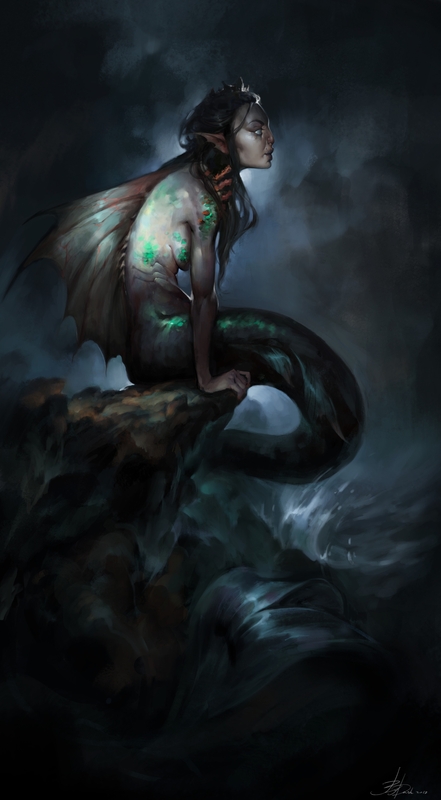 No wonder these scurvy sailers dreamt of glowing mermaids. Waiting to eat a sailor, more like. Ha. Cool image.